This special chapter explores & captures the wonders of Low and No light photography through the eyes of a British Winter. Exploring different subjects from the everyday norm to the more unusual, each image will take you 'Behind the Lens' detailing camera equipment, shooting technique, and useful tips. 7 hours of Earth's spin as shown through the stars. Spinning around the North Pole star 'Polaris' this composite image comprises over 1500 long exposures captured overnight in my local village of Cotesbach (you don't have to travel far to explore the heavenly wonders using low light photography). BEHIND THE LENS To capture this 'No Light' scene I mounted the camera on a tripod and set up the composition such that the church spire was pointing towards the North star Polaris (This ensures the full star swirling effect above the church spire). Set the focus to manual and shoot a few test images to ensure subject fits & is level (using LCD screen). Once I was happy with the composition and using the remote cable (set to lock - which forces the camera to shoot continuous exposures) I set the camera off. Make sure you switch off the lcd to maximise battery life. This allowed the camera to shoot continuous for 7 hours (using twin battery pack). The foreground, church & selected trees were lit up using a technique called light painting. During the first few exposures I shone a strong torch over the church & trees and 'painted' with light. This helps bring daylight to a 'No Light' scene. I then took the camera back indoors & transferred all 1500+ images (High res JPEG) to MAC and imported in StarStax software. This very useful (& free) software easily produces a single composite image. One thing you will get when shooting these multiple composite images (depending on where the shot is taken) is plane trails running across the image. It can spoil the final composite & I prefer to remove, again using software (Pixelmator). The resulting image reveals 7 hrs of Earth spinning, as shown through the stars. A stunning image which looks great framed & mounted on a wall. CAMERA: Olympus OM-D, E-M5 LENS: Zuiko Digital ED 7-14mm ACCESSORIES: Olympus Remote Control RM-UC1 SETTINGS: Manual, ISO 500, F4, 15s. Resolution MN (2560x1920) TIP: Bookmark interesting places of interest as you travel around & keep them in mind for specific shots (As I did with this shot). 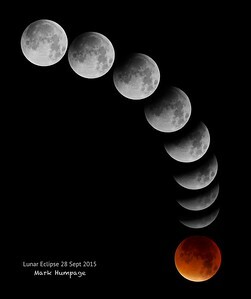 The fantastic Lunar Eclipse on 28 September 2015. This is a montage of the eclipse commencing from penumbral (when the Moon moves through the faint, outer part of the Earth's shadow) through partial and to full total eclipse (when Earth's shadow blocks the direct light from the Sun reaching the Moon's surface). The event occurred just after midnight running through to just before 0300hrs.....It was a long challenging Low light subject night! BEHIND THE LENS There was a fair bit of planning involved to watch and capture this rare old event. Firstly I closely monitored the local weather forecast, which fortunately was generally clear over most UK, except for localised low cloud areas & mist. The optimum clear sky forecast took me to South Wales (I chose Nash Point lighthouse). Over 3 hrs drive I arrived ay my destination. I set up 2 camera stations - one for a wide angle shot to include the lighthouse & the other on a full focal length zoom - the subject of this montage. I placed the camera with high focal zoom lens on a tripod and took a photo every couple of minutes to capture every slowly darkening phase from full moon through to full shadow (eclipse). Focusing (Auto) was easy enough at first but became increasingly difficult as the moon approached full eclipse. At this point I had to flick over to manual focus. It was a long night and working in no light, especially after a long drive, takes it toll. I encountered many technical & practical difficulties but managed to achieve my objective of capturing the event. After another long drive home (& good sleep) I then transferred all the images to MAC. Whilst I was keen to produce a montage composite of all phases I was still unsure of exactly which composition to portray the final image. I was keen to keep the image simple & not flood the final composition with dozens of phases (and lose the detail). In the end I selected 8 lead in (penumbra/partial) shots & 1 total eclipse, imported all into software (Pixelmator) and spent an age sliding and moving around to find the best arrangement. I started with a horizontal line, then vertical & ran lots of circular & curved formats but finally found one I was most happy with - the one you see now! The resulting image reveals over 3 hrs Lunar Eclipse phasing. A stunning image which looks great framed & mounted on a wall. The next total lunar eclipse will be on 31 Jan 2018...... CAMERA: Olympus OM-D, E-M1 LENS: Zuiko Digital ED 90-250mm with x2 TC (EC-20) ACCESSORIES: Olympus Remote Control RM-UC1 SETTINGS: Manual, ISO 200, F5.6, 1/640s. Resolution RAW. TIP: Use the LCD screen (touch) for accurate focusing. This also allows zooming of the subject on screen. 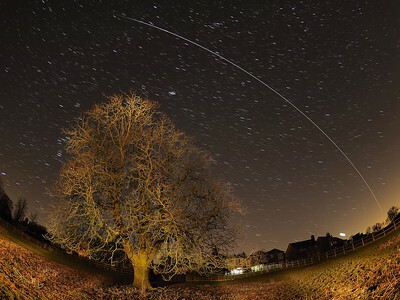 International Space Station (ISS) flyby over UK skies. This is a composite image comprising 16 No long exposures captured in the early evening overnight in my local village of Cotesbach (Again, you don't have to travel far to explore the heavenly wonders). This shot captures the 1903hrs pass. Especially dramatic as the flyby was almost overhead and flew right over the crescent moon, over the giant oak tree and fading out as the ISS enters Earth's shadow (love this). BEHIND THE LENS To capture this, firstly using the excellent GoSatWatch phone app, I was able to find the time and direction of the flyby (Almost always west to east). The flyby was also directly overhead, which required an extremely wide angle lens to capture land & sky - In this case the Olympus f1.8 8mm fisheye was perfect. I located a good foreground subject (oak tree) gauging where the ISS would rise from horizon & finish (using the app). I mounted the camera on a tripod and set up the composition such that the ISS would rise above the crescent moon (far right) and pass over the tree. Set the focus to manual and shoot a few test images to ensure subject fits & is level (using LCD screen). Once I was happy with the composition and using the remote cable (set to lock - which forces the camera to shoot continuous exposures) I waited for the ISS to come into view & set the camera off. The foreground & tree were lit up using a technique called light painting. During the first few exposures I shone a strong torch over the tree and 'painted' with light. This helps bring daylight to a 'No Light' scene. I then took the camera back indoors & transferred 16 images (High res JPEG) to MAC and imported in StarStax software. This very useful (& free) software easily produces a single composite image. The resulting image reveals over 4 mins of the Space Station flying overhead. Not only does it look good on camera it is also a spectacle to watch with the naked eye. Download the app, go outside & look up....it's that easy :-) CAMERA: Olympus OM-D, E-M5II LENS: M.ZUIKO DIGITAL ED 8mm 1:1.8 FISHEYE PRO ACCESSORIES: Olympus Remote Control RM-UC1 SETTINGS: Manual, ISO 400, F1.8, 15s. Resolution LN (4608 x 3456) TIP: Download GoSatWatch app which tells you all the ISS flyby times and maps where they will fly across the sky - A great tool. 4.5 hours of Earth's spin as shown through the stars. 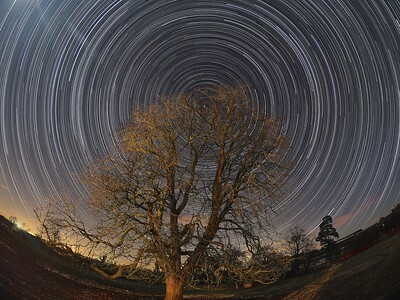 Spinning around the North Pole star 'Polaris' this composite image comprises over 1000 long exposures. BEHIND THE LENS To capture this 'No Light' scene I mounted the camera on a tripod and set up the composition such that the Oak tree was pointing towards the North star Polaris (This ensures the full star-spinning effect). Set the focus to manual and shoot a few test images to ensure subject fits & is level (using LCD screen). Once I was happy with the composition and using the remote cable (set to lock - which forces the camera to shoot continuous exposures) I set the camera off. Make sure you switch off the lcd to maximise battery life. This allowed the camera to shoot continuous for 6 hours (using battery pack). The tree was lit up using a technique called light painting. During the first few exposures I shone a strong torch over the tree and 'painted' with light. This helps bring daylight to a 'No Light' scene. Although the moon was pretty bright and assisted with ambient lighting (Moon rays just started to creep into the exposure top left). 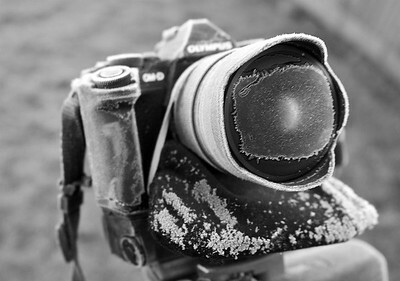 It was a very cold night (-1C) and the camera was frozen following the shoot. Before taking the camera back indoors I popped the camera into a plastic bag to allow the air temperature inside the bag to reach ambient room temperature without damaging the camera (air inside bag remains dry). Half hour later I transferred all 1000 images (High res JPEG) to MAC and imported in StarStax software. This very useful (& free) software easily produces a single composite image. One thing you will get when shooting these multiple composite images (depending on where the shot is taken) is plane trails running across the image. It can spoil the final composite & I prefer to remove, again using software (Pixelmator). The resulting image reveals 4.5 hrs of Earth spinning, as shown through the stars. CAMERA: Olympus OM-D, E-M5II LENS: Zuiko Digital ED 8mm ACCESSORIES: Olympus Remote Control RM-UC1 SETTINGS: Manual, ISO 400, F1.8, 15s. Resolution LN (4608x3456) TIP: Try to avoid very bright moon phases when taking Star Trails as they can create flare and/or undermine star brightness. 5 hours of Earth's spin as shown through the stars. 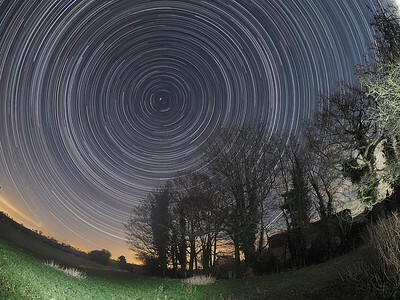 Spinning around the North Pole star 'Polaris' this composite image comprises over 1100 long exposures. BEHIND THE LENS To capture this 'No Light' scene I mounted the camera on a tripod and set up the composition such that the trees were pointing towards the North star Polaris (This ensures the full star-spinning effect). Set the focus to manual and shoot a few test images to ensure subject fits & is level (using LCD screen). Once I was happy with the composition and using the remote cable (set to lock - which forces the camera to shoot continuous exposures) I set the camera off. Make sure you switch off the lcd to maximise battery life. This allowed the camera to shoot continuous for 7 hours (using battery pack). The trees and foreground were lit up using a technique called light painting. During the first few exposures I burst a few flashes and 'painted' with light. This helps bring daylight to a 'No Light' scene. Although the moon was pretty bright and assisted with ambient lighting. It was a very cold night (-5C) and the camera/8mm lens unfortunately froze after 5 hrs due to dew shield (heater unit) failing - see previous pic of frozen camera. Before taking the camera back indoors I popped the camera into a plastic bag to allow the air temperature inside the bag to reach ambient room temperature without damaging the camera (air inside bag remains dry). Half hour later I transferred all 1100 images (High res JPEG) to MAC and imported in StarStax software. This very useful (& free) software easily produces a single composite image. One thing you will get when shooting these multiple composite images (depending on where the shot is taken) is plane trails running across the image. It can spoil the final composite & I prefer to remove, again using software (Pixelmator). 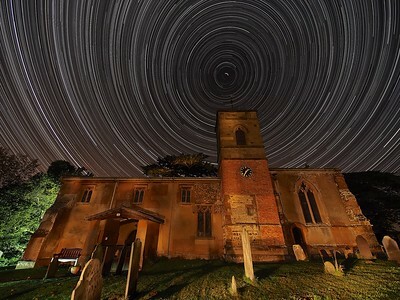 The resulting image reveals 5 hrs of Earth spinning, as shown through the stars. CAMERA: Olympus OM-D, E-M5II LENS: Zuiko Digital ED 8mm ACCESSORIES: Olympus Remote Control RM-UC1 SETTINGS: Manual, ISO 400, F1.8, 15s. Resolution LN (4608x3456) TIP: When shooting in cold conditions don't take the camera back indoors immediately (It will fog up and possibly cause moisture to form inside camera electrical workings). Pop the whole camera/lens into a plastic bag outside & then take indoors. Leave for half an hour & then take the camera from bag and download images as normal. Taken overlooking the Catthorpe Interchange (M6/M1/A14) during construction. 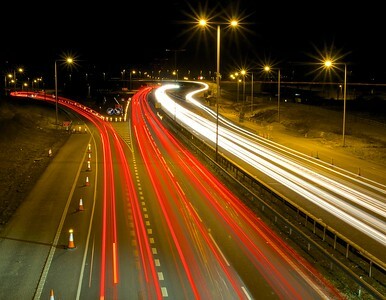 This low light long exposure captures the sweeping headlights and taillights as traffic passes through the junction. BEHIND THE LENS To capture this 'Low Light' scene I firstly visited the location during the daytime in order to find a good location to set the camera in order to gain an elevated position above the Interchange. I then revisited the location at night and mounted the camera on a tripod ensuring all motorway approaches and exits were within the frame. The camera was set in Manual mode and auto focus (I used the LCD touch screen to set point of focus). In order to maintain sharpness, a good depth of field and ensure the shot does not become too overexposed (lots of street lights) I pushed the aperture size as far as it could go - f22. This also creates the 'starburst' effect with the street lights. Testing exposure times between 15 & 30s. For this shot I used 25s. I played around with the White Balance (Auto/Tungsten/Fluorescent/Incandescent & even Underwater to get a good range of white balance tone) - This shot was Auto. I also used the remote cable to ensure no vibration and fired off 2 No 25s exposures. Back in the warm I transferred the images to MAC. I particularly liked the composite & effect of 2 shots so I Imported in StarStax software to create a 2 x 25s composite. This composite is essentially a 50s exposure (In hindsight I could have simply doubled the exposure time, but always wary about noise when pushing single exposure shots beyond 30s). The resulting image 50s of traffic movement through the Interchange. Looks pretty cool :-) CAMERA: Olympus OM-D, E-M5II LENS: Zuiko Digital ED 12-40mm ACCESSORIES: Olympus Remote Control RM-UC1 SETTINGS: Manual, ISO 200, F22, 25s. Resolution RAW TIP: Try to visit a nighttime location in the day to find a good composition location in readiness for the night time return. 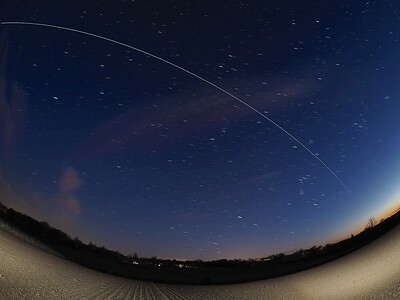 International Space Station (ISS) flyby over UK skies. This is a wide angle composite image comprising 30 long exposures captured in an evening overnight flyby. This shot captures the 2055hrs pass. BEHIND THE LENS To capture this, firstly using the excellent GoSatWatch phone app, I was able to find the time and direction of the flyby (Almost always west to east). The flyby was also directly overhead, which required an extremely wide angle lens to capture land & sky - In this case the Olympus f1.8 8mm fisheye was perfect. I located a very simple clutter free foreground subject (open field) gauging where the ISS would rise from horizon & finish (using the app). I mounted the camera on a tripod and set up the composition such that the ISS would rise in the west (right side of image) and move across horizon to the East (left side of image). Set the focus to manual and shoot a few test images to ensure subject fits & is level (using LCD screen). Once I was happy with the composition and using the remote cable (set to lock - which forces the camera to shoot continuous exposures) I waited for the ISS to come into view & set the camera off. The foreground field was lit up using a technique called light painting. During the first few exposures I shone a strong torch over the field and 'painted' with light. This helps bring daylight to a 'No Light' scene. I then took the camera back indoors & transferred 30 images (High res JPEG) to MAC and imported in StarStax software. This very useful (& free) software easily produces a single composite image. The resulting image reveals over 5 mins of the Space Station flying overhead. Not only does it look good on camera it is also a spectacle to watch with the naked eye. Download the app, go outside & look up....it's that easy :-) CAMERA: Olympus OM-D, E-M5II LENS: M.ZUIKO DIGITAL ED 8mm 1:1.8 FISHEYE PRO ACCESSORIES: Olympus Remote Control RM-UC1 SETTINGS: Manual, ISO 250, F2, 8ss. Resolution LN (4608 x 3456) TIP: Look for a good foreground subject that allows a full west to east horizon.